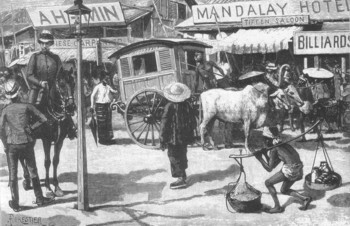 Burma (now called Myanmar) has more than a hundred distinct ethnic groups, but Burmese cuisine has mostly been influenced by the cooking styles of India, Thailand, Cambodia, and China–the homes of most of the original immigrants. Tibetan people arrived in Burma in the ninth century A.D., and the Mongol Dynasty from China conquered the region in 1272, so the Chinese influence on cooking is significant. However, since the very first settlers of Burma were the Sakya warriors who migrated from India and settled at Tagung about 250 B.C., it is not surprising that curries play an important role in the cuisine. Burmese cuisine is a culinary treasure; the dishes are easy to prepare and offer delightful challenges to adventurous cooks. The Burmese often quote a proverb: “You cannot meditate on an empty stomach” to explain their love of good food. The cooking of the country, like that of any other nation, has regional variations. The Shaan people, from neighboring China, use the least amount of spices and use soy sauce instead of fish sauce. 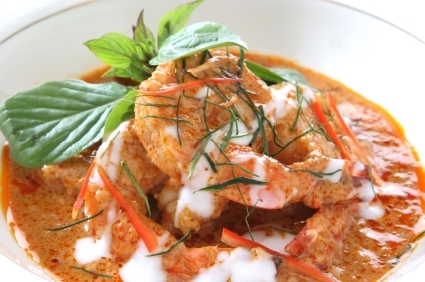 The people bordering Thailand make their curries more soupy, and those in the southern region enjoy spicier curries. According to my friend Richard Sterling, who has reported on Cambodia, Vietnam, and Laos as a contributing editor, “The Burmese cook approaches curry in a way as constant as the ancient past or the monsoon cycle.” During his extensive visits to Burma, Richard watched many curries being prepared. First, the Burmese make a curry paste out of their five basic ingredients: onions, garlic, chiles, ginger, and turmeric. Some Burmese cooks use other other spices as well, including an occasional prepared curry powder. But the hallmark of the Burmese curry is its oiliness. The cooks use a combination of peanut oil and sesame oil, about a cup of each in a wok, and heat it until it smokes–this is called “cooking the oil.” The curry paste is added, the heat is reduced, and the paste is cooked for fifteen minutes. Then meat is added, cooked, and eventually the oil rises to the top. This state is called see byan, “the return of the oil.” When the oil floats on top, the dish is done. The oil is not skimmed off the top, but rather is absorbed by the side dish of rice when it is served. In neighboring Thailand, the people believe that they had more time to evolve their unique cooking because they were smart enough to keep would-be foreign invaders at bay. Thailand is the only Asian country that was not subjected to European rulers; it was rarely overrun by its Asian neighbors, and it has seen relatively very few wars. These unique conditions gave the Thai kings time to spend with their queens and mistresses, to hire the best cooks, and to encourage the cooks to create new dishes and improve the traditional ones. 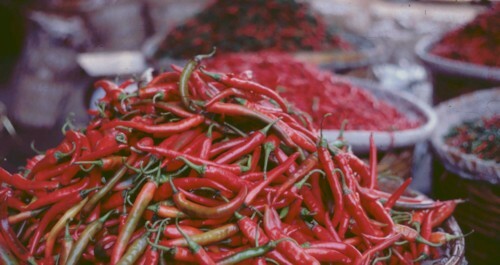 The Thai curries are extensively spiced with chiles. Contrary to popular belief, there is not just one “Thai chile,” but rather dozens of varieties used in cooking. When I toured the wholesale market in Bangkok in 1991, I found literally tons of both fresh dried chiles in baskets and in huge bales five feet tall. 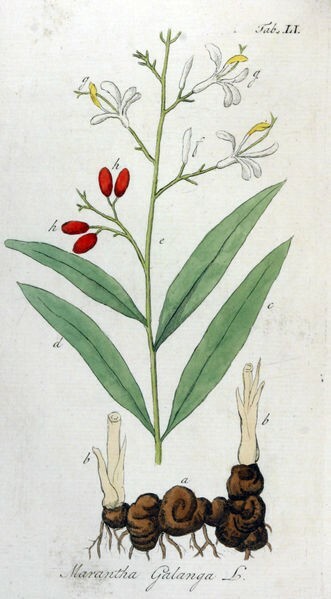 They ranged in size from piquin-like, thin pods barely an inch long to yellow and red pods about four inches long. When making substitutions, cooks should remember that, generally speaking, the smaller a chile, the hotter it is. At left, prik chee fah chiles in Bangkok. It is the fresh chiles that are ground up with other ingredients to make the famous Thai curry pastes, but rehydrated dried chile can be substitued in a pinch. 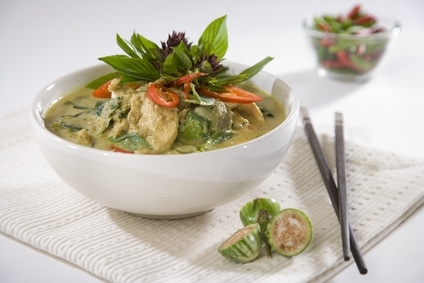 Two key curry pastes are the heart of Thai cooking; a red curry paste, called nam prik gaeng ped, uses red chiles, lemon grass, galangal and a number of herbs. The green curry paste is made with small green Thai chiles, but serranos make a good substitute. It looks deceptively mild, like a Mediterranean pesto, but it very hot indeed. These pastes are easily made fresh, keep well for at least a month in the refrigerator, and add a terrific zing to curries, but some very tasty commercial curry pastes are available in Asian markets. A yellow curry paste, colored with ground turmeric, is perhaps the mildest among all Thai pastes. A visitor to a Thai home or restaurant is won over not only by the aromatic food but also the elegant way it is served. Commonly accompanying Thai curries are elaborately carved fruits and vegetables, which often resemble large flowers. 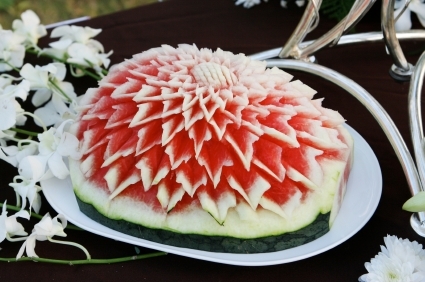 Rosemary Brissenden, author of Joys and Subtleties: Southeast Asian Cooking, described the art: “Fruit and vegetable carving is traditionally a highly cultivated art. Anyone who has watched the infinite calm of a Thai woman carving a piece of young ginger into the likeness of a crab with its pincers at ready will bear witness to this. Thai salads are also artistically arranged, and food historians believe that such elaboration dates back to the days of royal culinary competitions, when the dishes had to look as spectacular as they tasted. While the foods of Thailand have been covered with increasing frequency in books and magazine articles, and articles and books appear on Burmese and Vietnamese cuisines occasionally, hardly any information is available on Cambodian and Laotian foods. This is one of the unfortunate results of warfare and unstable political situations in the two countries. Again, I have depended on Richard Sterling for most of our information on Cambodian and Laotian curries. He was brave enough to travel to these countries in the early ’90s collect some curry recipes for me. In nearby Laos, two distinctive styles have emerged. 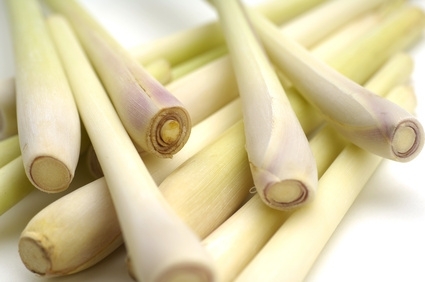 One is that of the Laotians, whose cuisine is very similar to that of the Thais except that lemongrass and galangal are only rarely used in their curries. The other cooking style is that of the Hmong, a tribal people of southern Chinese origin. The Hmong cuisine, naturally, was inspired more by the Chinese, so soy sauce replaces fish sauces. Shallots, ginger, and chiles are also common in Laotian curries. All of the ingredients are pounded together in a mortar until they are very smooth, and then are cooked in coconut milk until a silky sauce is formed. “A good Laotian curry sauce is similar to the consistency of hollandaise,” says Richard. 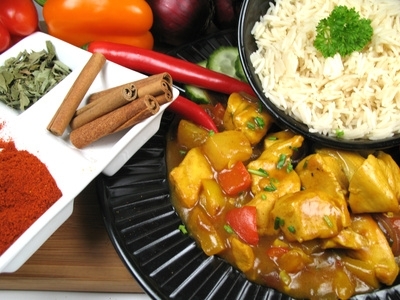 Meats and fish are commonly curried in Laos, but not vegetables, which are eaten on the side. 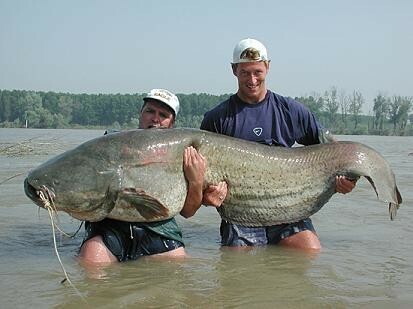 Of particular interest are the huge Asian catfish found in the rivers of Golden Triangle countries, seen at left. Here is curry done in the Burmese style from a recipe collected by Richard Sterling. He comments: “This is a wet curry, or curry with gravy; it cries out for rice, or even mashed potatoes to sop up the delicious sauce.” The eggplants are the small, Asian variety. Combine the oils in a wok, heat, and quickly brown the eggplant, stirring often, for about 6 minutes. Combine the chile, onions, garlic, ginger, turmeric, and lemongrass in a food processor or blender and puree to a fine paste. In a wok the paste in the oil, stirring often, for about 10 minutes, adding a little water if the paste begins to stick to the wok. Add the chicken pieces, stir to coat with the paste, cover, and simmer for 20 minutes. Add the beer, wine, eggplant, and fish sauce, stir, cover, and simmer for another 20 minutes. Just before serving, stir in the cardamom and cilantro, cover, and let sit for a minute or two. A popular ingredient in Thailand, this curry paste can be added to any dish to enhance its flavor. It is, of course, a primary ingredient in many of the famous Thai curries. Traditionally, it is patiently pounded by hand with a heavy mortar and pestle, but a food processor does the job quickly and efficiently. It will keep in the refrigerator for about a month. Marinate a dozen shrimp in this paste, stir fry them quickly with the paste in canola oil, and the result is an instant lunch or dinner. 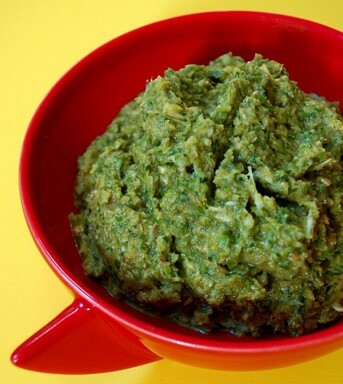 This standard Thai green curry paste has dozens of uses; it is a must for green chicken curry. 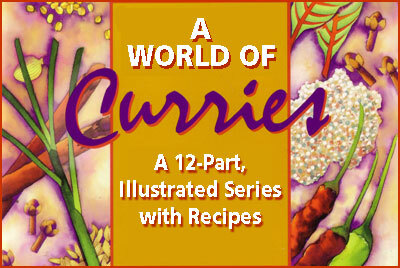 It can be added to any other curry preparations, be it Indian, Vietnamese, or Cambodian. Just adding one teaspoon of this paste will make other curry concoctions more flavorsome, more zesty, and more pungent. Heat this paste in a wok or skillet, add your favorite chopped meat, fish, or vegetables, cook for 20 to 30 minutes, and you have a wonderful Thai curry to serve over rice. Roast the coriander and cumin seeds for about 2 minutes in a dry skillet, and when they are cooled, grind to a fine powder in a spice mill. Combine all ingredients in a food processor or blender and puree until a fine paste is formed. Pour the paste into an airtight jar and refrigerate. It will keep in the refrigerator for about a month. In a food processor or blender, puree together the lemongrass, garlic, galangal, turmeric, jalapeño, and shallots. Bring the coconut milk to a boil and add the pureed ingredients, lime leaves, and salt, and boil gently, stirring constantly, for about 5 minutes. Reduce the heat to low and simmer, stirring often, for about 30 minutes, or until the lime leaves are tender and the sauce is creamy. Remove the leaves before serving. In a food processor, combine the shallots, ginger, chiles, garlic, and galangal and puree to a smooth paste. Bring the coconut milk to a boil in a wok, add the paste, reduce the heat slightly, and cook, stirring occasionally, for about 5 minutes. Add the tomato and eggplant and cook for five more minutes. Add the catfish, beans, cilantro, and fish sauce, and cook over medium heat for ten minutes, or until the beans are tender. The curry should be quite liquid, so add some water or fish stock if necessary. 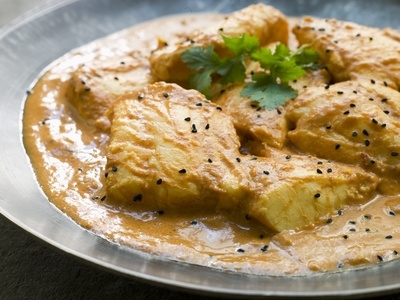 According to tradition, Indian merchants brought this curry to Vietnam more than ten centuries ago. The Vietnamese have made it their own, adding lemongrass and sweet potatoes to it. Note: This recipe requires advance preparation. Combine all the dry spices, sugar, and salt and toss with the chicken. Marinate for 1 hour at room temperature. In a large skillet or wok, heat the oil for 1 minute over medium heat, and fry the sweet potatoes for about 10 minutes. Remove the sweet potatoes and set aside. Using the same oil, fry the garlic and onions for 3 minutes over low heat. Add the bay or curry leaves and the lemongrass. Stir and cook for 1 minute. Add the chicken with its marinade, mix well, and cook over high heat for 2 minutes, stirring occasionally. Add the coconut milk, mix well, and cook, covered, for 10 minutes. Add the carrots and milk and cook, covered, for 10 minutes.